KUALA LUMPUR: “Whether we are white, black, brown or blue, we are all Malaysians, right?” This was part of a dialogue spouted by actress/director Susan Lankester in the 1983 Malay movie “Mekanik”. The celebrity, who is of English-Chinese parentage and speaks Bahasa Malaysia fluently, later on shared those words on her Twitter account. Those words may seem simple but if examined closely there is a hidden message behind it. 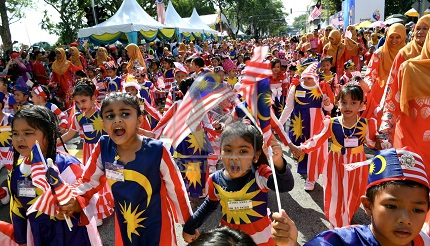 Yes, no matter what colour our complexion or eyes may be, we are all Malaysians. And, if explored further, we will realise that although we may have different racial, religious and cultural backgrounds, we are still one simply because we are Malaysians. The Solidarity for Peace march to be held today is a fitting way to reinforce unity among the people. Leaders from various religious groups are expected to attend the event led by Minister in the Prime Minister’s Department Datuk Seri Dr Mujahid Yusof Rawa. The event is also to show solidarity with the victims of the Christchurch terror attack and is scheduled to start from 7.30am at Dataran Merdeka. It is our plural society that makes our country unique and rich in culture as each community has its own customs and beliefs. We have been living like this for decades. The Malays and Chinese enjoy eating “roti canai” and “tosai” at Mamak restaurants while the Indians indulge in “nasi lemak” prepared by the Malays. We celebrate our differences and respect each other. Hari Raya, Chinese New Year, Deepavali, Christmas and festivals observed by other ethnic groups are celebrated in an atmosphere of “muhibbah” or goodwill. The assimilation of cultures is also evident. For example, the Malays refer to “duit raya” as “ang pow” and some of them are even adopting the Bollywood theme for their pre-wedding henna function. It is safe to conclude that a majority of Malaysians are tolerant and live in harmony as they are aware that they play a role in keeping this nation peaceful. Sometimes misunderstandings do arise but fortunately, they are not serious enough to cause disunity. Lately, however, certain quarters have been deliberately triggering conflicts that evoke a sense of uneasiness. Such display of extremism has become quite common now. Some people deliberately insult the Yang di-Pertuan Agong and the religion, customs and culture of other communities to create tension among the various races. Recently, a trader was detained by the police after he allegedly posted comments belittling the Yang di-Pertuan Agong on his Facebook account. However, the 46-year-old man from Kuantan was released on police bail. In February, the Muslim residents of Taman Pendamar Indah, Klang, were shocked following the discovery of two idols at Surau Sabilul Huda. Police have since arrested a man who admitted to placing the idols at the surau. Police have also claimed that the suspect was a practitioner of deviant religious knowledge. The police, meanwhile, have filed charges against four social media users for insulting Islam and Prophet Muhammad SAW. One of them has been slapped with a jail sentence. On March 11, an unemployed man was sentenced to seven months jail and fined RM10,000 by the Sessions Court here for committing a similar offence. And on March 12, the police nabbed a Facebook user for posting offensive remarks against Hindus. The 52-year-old man is being investigated under Section 298 A of the Penal Code for causing disharmony, disunity or feelings of enmity, hatred or ill-will. The International Women’s Day celebration at Dataran Merdeka, here recently, saw the participation of lesbian, gay, bisexual and transgender (LGBT) groups, provoking the ire of Islamic non-governmental organisations and religious leaders who said such things were not in line with Malaysian culture. Why are some people being so provocative and insensitive, and out to challenge our country’s existing laws? What are they trying to prove? While groups like these can trigger other problems, their supporters maintain that they have the right to freedom of expression. But does this freedom give them the green light to do whatever they want despite the negative implications of their actions? Previously in a Bernama report, political analyst and Universiti Islam Antarabangsa Malaysia law lecturer Prof Dr Nik Ahmad Kamal Nik Mahmod was quoted as saying that the right to freedom of speech and expression provided for under Article 10 (1) (a) of the Federal Constitution comes with restrictions. The government has the right to impose restrictions to safeguard the security of the nation, public order or morality. Restrictions can also be imposed to protect the privileges of Parliament or to provide against contempt of court, defamation or incitement to any offence. In these challenging times, it is good to exercise self-restraint in or out of social media so as not to create any dispute or disharmony. We would get angry if others insulted us or our family, race or religion. Hence, if we want others to respect us, we should respect them too. The harmony enjoyed by our plural society is a reflection of our nation’s ability to create a culture of mutual respect despite the diverse backgrounds of the population. Fikirlah: Solidarity for Peace march to preserve inter-ethnic harmony 0 out of 5 based on 0 ratings. 0 user reviews.